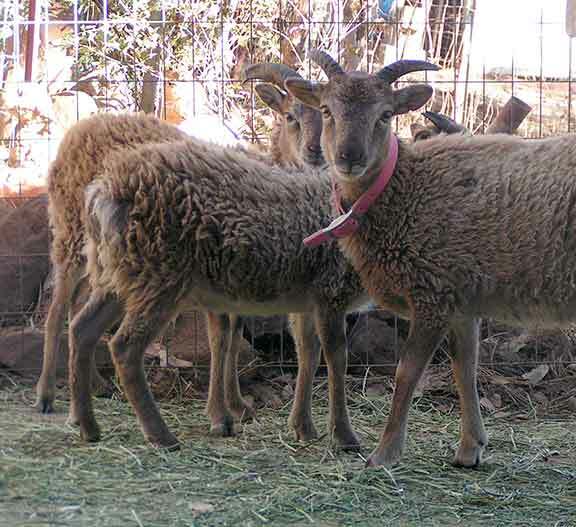 In October I traded three San Clemente kids for two Soay sheep ewes and one ram. 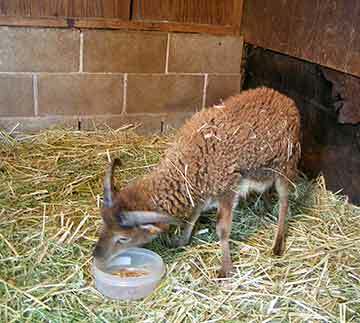 Soay sheep are naturally timid and bold easily. They are difficult to herd. During the hot months of summer’s end I kept them in the pen with the buckling goats. Things were working out okay. First I had them separated inside a smaller pen within the confines of the goat pen. Later I kept the door of the small pen open so that the sheep could investigate the space where the goats lived. The goats and the sheep seemed to be working out well together. But as fall approached and the first early rain began to fall I put my animals in the barns for the night. I had to catch the sheep and put them in the stall with the male goats. I tethered the older buck since he was getting aggressive with the younger bucks. I checked them several times before I went to bed to make sure that everything was working out with the animals in the confined space. Things look quiet. Everyone was bedded down. But the next morning was a different story. 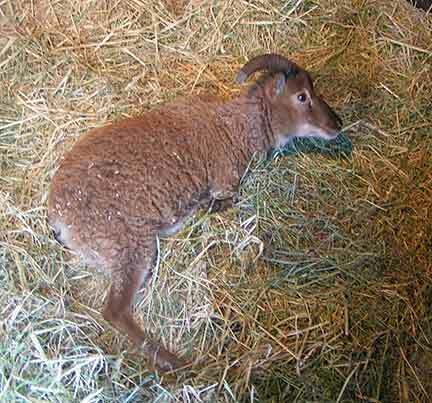 The little ran was lying on his side and something was terribly wrong. I checked his temperature and it was normal. So I determined that he must be injured in some way. I put the goats out and put up a divider between the ram and the ewes since they kept trampling him every time they got spooked which was all the time. For a week I had fed and watered him. At night I brought him in the house. Since it was so warm with the fire going night and day I kept him in the hallway. During this time he ate and pooped but he would not stand on his feet. I was finally able to get the veterinarian to come out to the ranch. 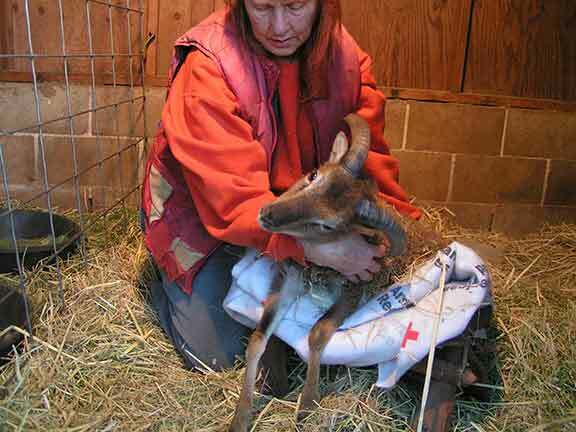 She took one look at the little ram and diagnosed a neurological disorder from poisoning, possibly from Listeria bacteria. Listeria is everywhere and possibly the stress of being transported from Minnesota brought on the infection. The vet gave him one injection of BO-SE. For two weeks I injected him twice a day with penicillin. I wormed him, orally, for three days with Panacur and injected him two times a day for three days with vitamin B complex. By the end of two weeks he was eating vigorously and drinking on his own but still not standing up. Using an Middle Eastern burro saddle to get the ram to support his weight on his legs. The vet suggested that I make a harness for him to get him on his feet. I ended up using a burro saddle with some padding I would place him on the saddle with his feet on either side. It was just high enough for him to begin putting weigh on his legs. I did this twice a day for a half hour each time. Three days later I found him standing on his own and the next day he had broken into the next stall and was standing with the two ewes. Today he is standing on his own but still turning with his head at an angle. Little ram standing on his own. As the weeks have passed I have been letting the ewes out to run around. But the little ram will not leave the stall. One sunny day I carried him outside and he did wander around for a short time on his own. I am hoping he is going to outgrow the turning behavior. The vet has suggested more Vitamin B.